Manchester City midfielder Yaya Toure will leave the Premier League champions at the end of the season. The 34-year-old will make his final appearance against Brighton on Wednesday, said manager Pep Guardiola. 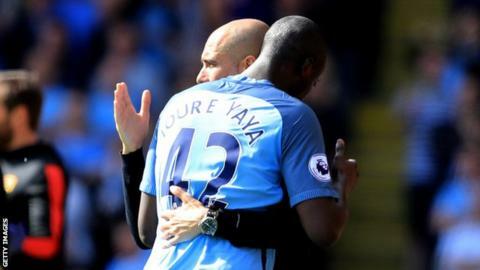 Ivory Coast international Toure, who joined City from Barcelona for a fee of about £24m in 2010, signed a new one-year contract in June 2017. “We cannot forget the period from Roberto Mancini, and especially Manuel Pellegrini, Yaya was the key player. “The Brighton game we will give him what he deserves, one of the most beautiful farewells a player can receive. City host Brighton on 9 May before travelling to Southampton for the final game of the season. Toure has made 229 Premier League appearances in his eight seasons at Etihad Stadium. He has won three league titles, an FA Cup and two League Cups in his time at the club but has made just nine league appearances this season. Next Post Pictures: Amazing Couple From New York tie the Knot!